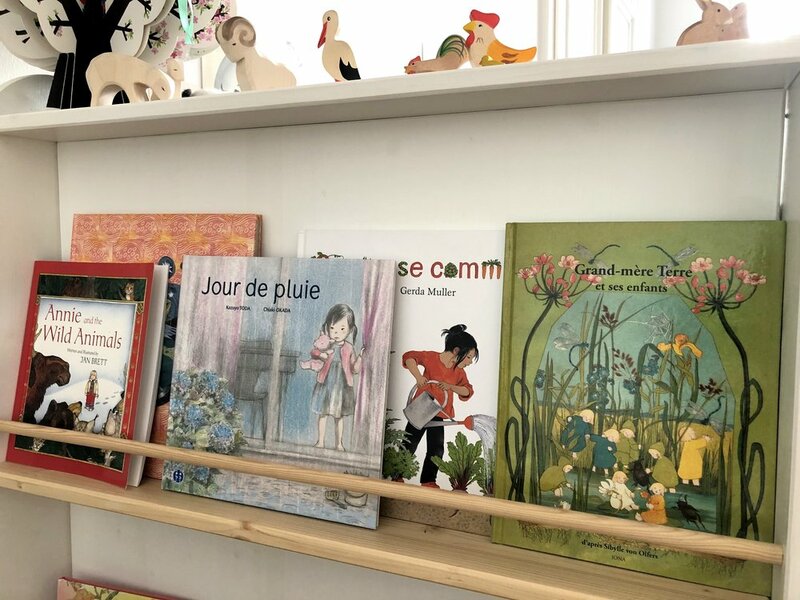 “Arbre” by Amandine Laprun is the book you see on the left side of the picture here above. It has the form of the tree and the pages follow the changes of a tree through the seasons. It’s simply gorgeous. 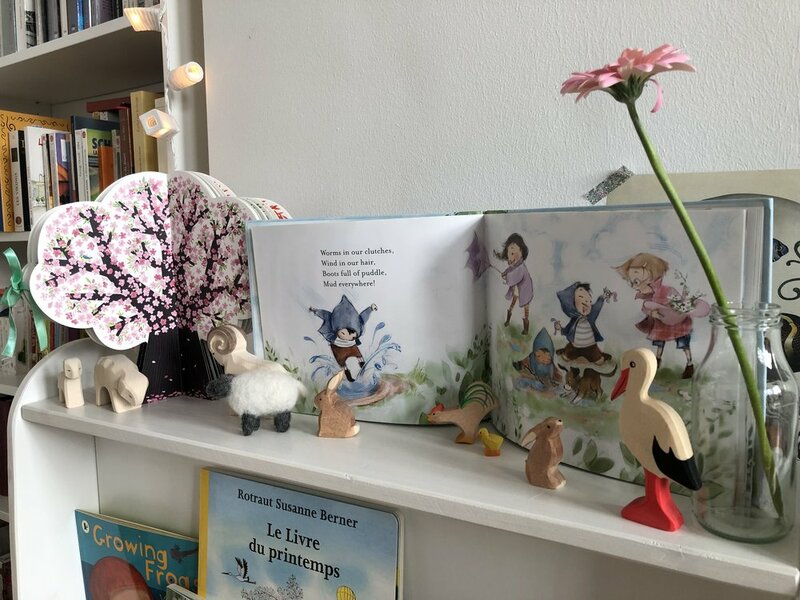 We love it because we can easily match the picture of the book with how the cherry tree in our garden looks like. 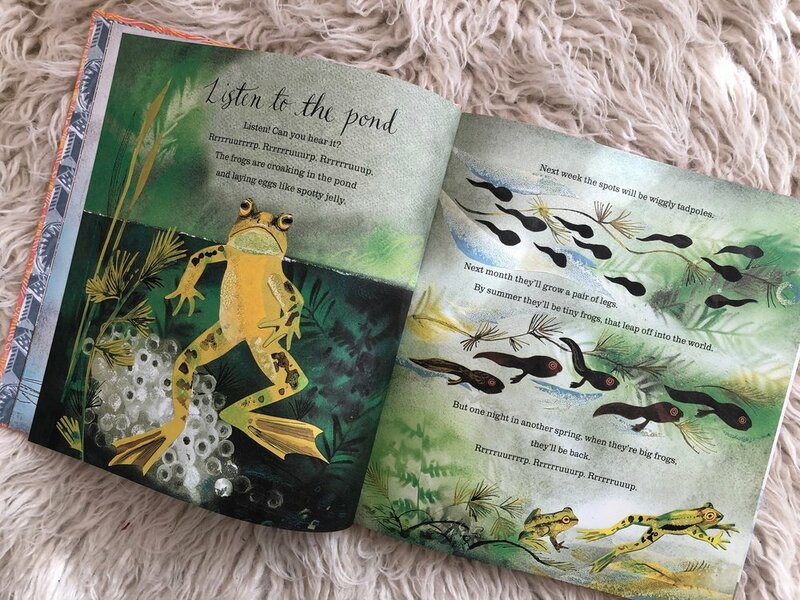 “Bringing the outside in“ by Mary McKenna Siddals and Patrice Barton Montessori-friendly, beautiful text, gorgeous illustrations. The children in the book have so much fun outdoor that it’s contagious. All we want to do when we finish reading it is “go outside and play” and that’s exactly the invitation on the last page of this book. 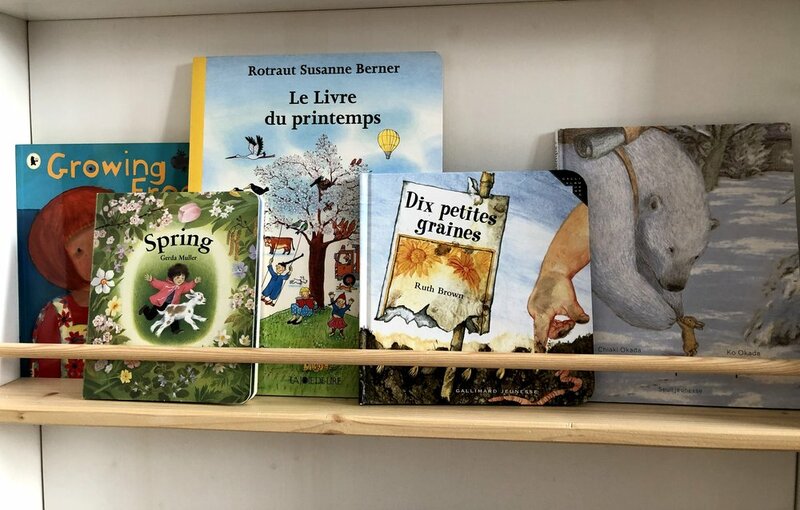 “Le Livre du printemps” by Rotraut Susanne Berner originally in German but is a book without text (except for some logos), from a series of books about seasons. We love the big format, that wonderfully features so many details and the gorgeous drawings. We discover something new each time we go through this book and we can follow some of the characters all through the four seasons. “C’est déjà le printemps” by Kazuo Iwamura. We are big fans of this Japanese author. We follow the adventures of the 3 little squirrels throught the year and here they are again: it’s already spring and they want to discover where the snow goes. This is not a Montessori-friendly book because there are talking animals inside but the adventures of these animals are so real that I don’t know any child who read Kazuo Iwamura books and didn’t fall in love with them. 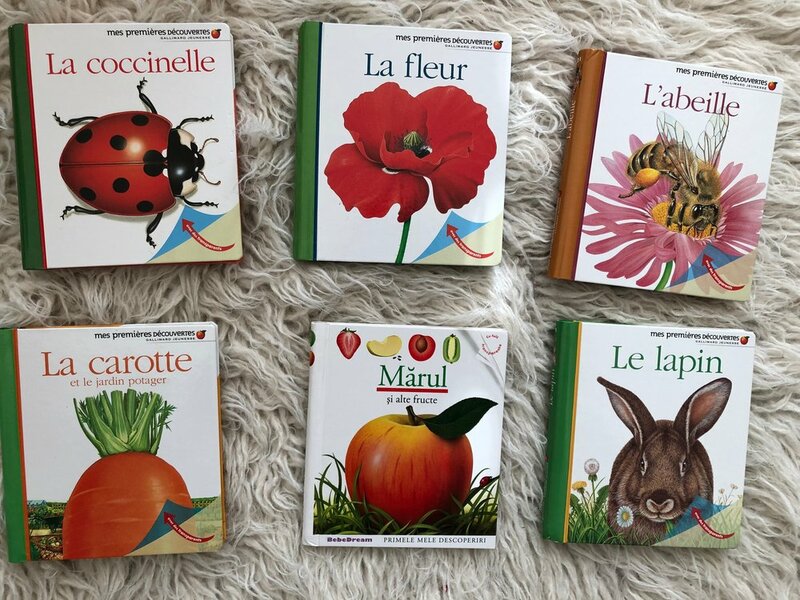 “Fruits, fleurs, légumes e petites bêtes” by François Delebecque a flip-flap book where children can see the shadow of fruits, vegetables, insects, gardening tools and guess which one this is. 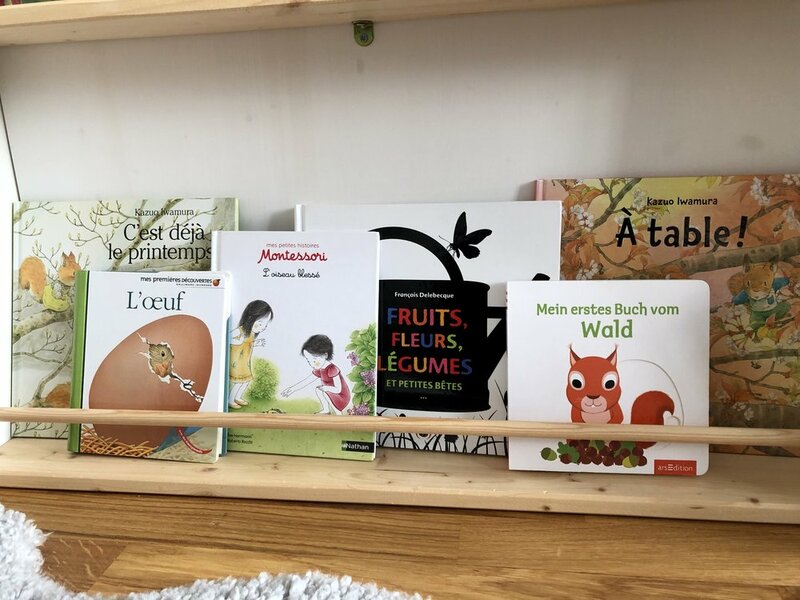 A great support for learning new vocabulary for younger children and if you are starting your journey of learning French. My daughter loved it and it will be great for my son this spring. As all the babies, he loves images with contrasts and this book is perfect. “A table!” by Kazuo Iwamura. Again the squirrel family! Nic, Nac and Not, the 3 little squirrels try to guess what a little bird eats. They try to feed him pine cone seeds, cherry flowers,.. and they are surprised to find out what a little bird really eats. My daughter loves it! 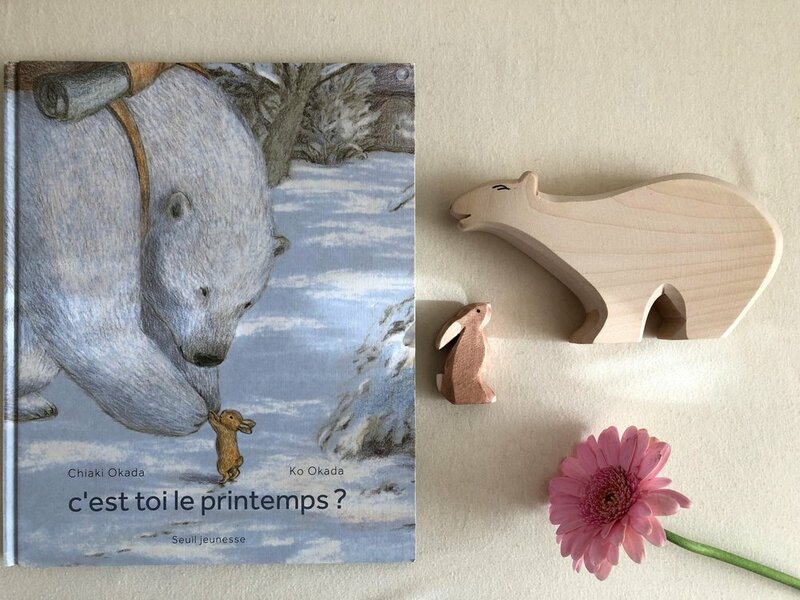 “Jour de pluie” by Kazuyo Today and Chiaki Okada, the same author as “C’est toi le printemps?” is about how to turn a boring rainy day into a great adventure. Beautiful illustrations! 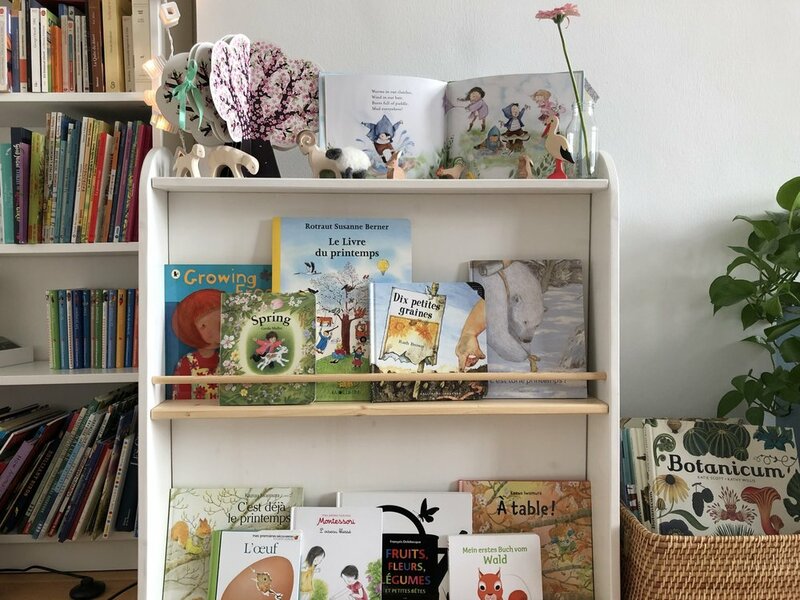 “Ca pousse comment?” by Gerda Muller, another little treasure from Gerda Muller that can inspire you to grow your own vegetables. Montessori-friendly with beautiful illustrations, very informative and fun at the same time. “Grand-Mère Terre et ses enfants” by Sibylle von Olfers. A Waldorf book, originally written in German “Etwas von den Wurzelkindern” it has been translated into English as well “The Story of the Root Children”. It’s the story of the seeds preparing to leave their Grandmother’s home, the Earth, to go out into the world with their most beautiful colours when spring arrives.